Emyr John has written and directed a new show in the Welsh language to be performed in Bangor and Mold. What happens to stories once they’ve been told? Where do they live? Where do they go? 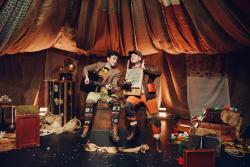 Join us this year and find out as Pontio and Theatr Clwyd present their brand new Christmas show, Llew a’r Crydd. Two brothers travel around the world collecting stories to stop them from getting lost. One Christmas Eve, unable to sleep knowing that Father Christmas is on his way, they tell a story, a story of Llew, a mean old cobbler, a magic elf, and a Princess who just wants to dance. Join us on a magical adventure, told through music, storytelling and the odd, and we mean odd, looking puppet. Llew a’r Crydd is the first ever co-production between two of the leading theatres in North Wales. It will open at Pontio in Bangor on Tuesday 18 December until Saturday 22 December and then move to the Clwyd Room at Theatr Clwyd, 2-6 January. Tamara Harvey, Theatr Clwyd’s Artistic Director, commented: “This, our first co-production with Pontio, is a landmark moment for both theatres and it’s particularly special to be collaborating over the festive season. We are passionately committed at Theatr Clwyd to creating engaging and imaginative theatre in the Welsh language and we can’t wait to delight children and their families from across North Wales and beyond." Theatr Clwyd’s Creative Engagement Associate Emyr John is a writer, actor and director who has been working in Wales for the past 25 years.